Have you ever picked a crab? If so, you know the challenge of separating tasty morsels of meat from the rest—gills, shell, and so forth. 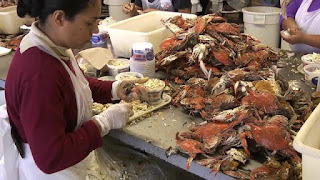 When friends gather around a newspaper-covered picnic table strewn with steamed crabs and grilled corn on the cob (with plenty of paper towels on hand, and perhaps some ice-cold beer for good measure), crab picking can be a leisurely and companionable activity. But if you want to serve crab as a main dish to share with others, procuring enough meat is daunting if you have to do it yourself. Enter the crab pickers. For me, they are among the unsung heroes of my local farmers’ market. I don’t know any of them even by sight, much less by name, but each time I buy a quart of fresh crab meat—which is nearly every week in the summer—I bless them. Each time I make crab cakes or crab salad, I give thanks for the work of their hands. I suspect that most of the crab pickers do that hard work because they need a job to put food on their own tables, and to that end, I hope they are paid a fair wage. I doubt the crab pickers would say they feel particularly called to that work or think of it as “ministry.” And yet…. I am thinking especially of the crab pickers today because friends are coming tomorrow for lunch. We’ll have crab cakes. Because I have picked enough crabs in my own lifetime to know what is involved in producing the crab meat we will eat, I feel enormous gratitude for the crab pickers who make fresh, local crab meat readily available for purchase. I am also grateful to them because they remind me that there others (at least dozens, probably hundreds or more) “behind-the-scenes” people—people who are not my friends, my family, my neighborhood neighbors, or my colleagues—who, simply by showing up to do the work they do, contribute to my life every day. Theirs is a kind of faithfulness that often goes unrecognized and uncelebrated. And so today, when I count my blessing and say my prayers, I will remember the crab pickers. And today may I too be faithful in showing up to do my work. Mix the first four ingredients really well until the lumps of crab are shredded and everything sticks together. 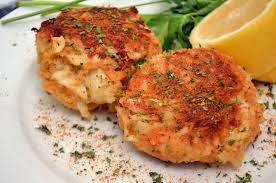 (Retaining lumps of crab meat will make the patties fall apart during cooking). Shape into patties. Heat 3-4 Tbs. oil in skillet medium high (on a scale of 1-10, try 8). Fry crab cakes to a deep golden brown on each side. Drain on paper towels. Replenish oil as need during the cooking process--some will be absorbed.